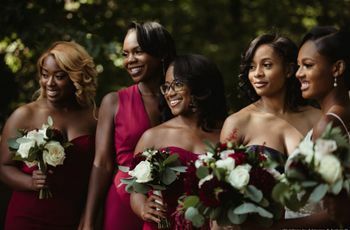 If your ultimate bridesmaid squad includes a junior member, you likely have some questions about what the junior bridesmaid role entails. We’re here with answers! 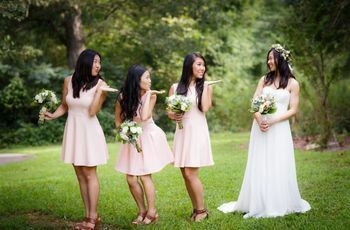 If you have a tween sister or cousin whom you want to include in your wedding party, your best bet is to assign her the role of junior bridesmaid. But what is a junior bridesmaid and what does the job entail? In short, it’s basically a younger member of the bridal party with some similar responsibilities, scaled down to be kid-appropriate. Not only is the junior bridesmaid role an honor for your young relative, it’s also quite exciting and fun! We’re here to answer to all of your junior bridesmaid questions. A junior bridesmaid is a perfect role to offer a relative or family friend who is a bit too old to be a flower girl and a bit too young to be a bridesmaid—think tweens and young teenagers. A junior bridesmaid’s age varies, but she’s usually older than eight but under the age of 14. What are a junior bridesmaid’s duties? 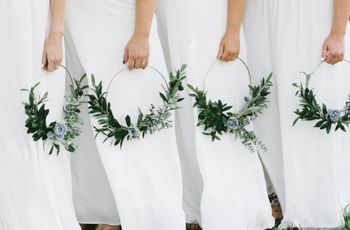 A junior bridesmaid is expected to fulfill some of the traditional bridesmaid duties including wearing a dress of the bride’s choosing, attending the rehearsal and rehearsal dinner, participating in the ceremony processional, and standing at the altar with the bridal party. Optional duties include helping out with smaller wedding-related tasks, attending pre-wedding celebrations like the bridal shower or engagement party, and participating in the receiving line (if applicable). How should I ask her to be in the wedding? We highly recommend talking the idea over with her parents first. 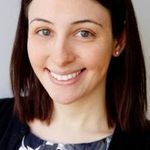 Not only will they have a good idea of her schedule and whether it's something she would feel comfortable taking on—they will also likely be the ones footing the bill for the dress and any other expenses the junior bridesmaid role might entail. Once they're on board, it's time to pop the question! You can simply ask her in person or provide her with a little gift. Either way, be enthusiastic and make sure she knows you're there to answer any questions or concerns she may have. 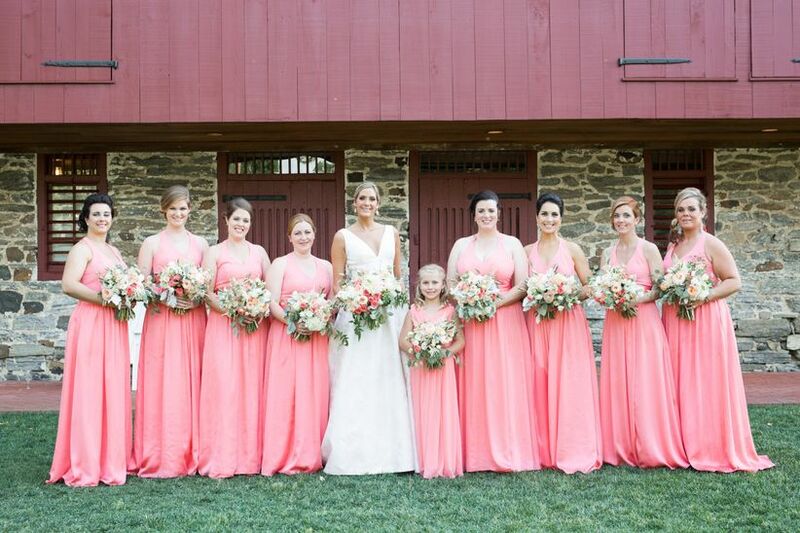 Does a junior bridesmaid wear the same dress as the other bridesmaids? There are no hard-and-fast rules here—it’s really up to you! 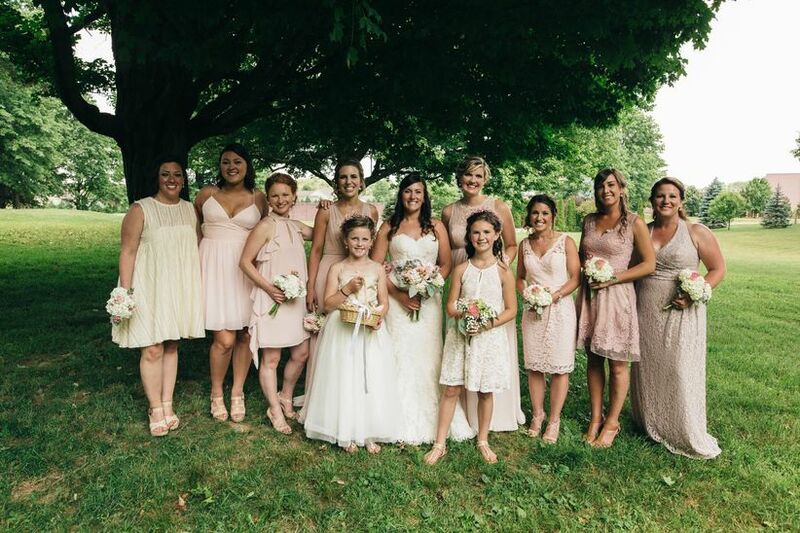 If the bridesmaid dress you’ve chosen comes in junior sizes and you feel the style is age-appropriate, then go ahead and match your junior bridesmaid to the rest of the bridal party. Otherwise, hunt for a dress in a similar color, style, or fabric. As long as it complements the overall look, there’s no need for it to match exactly. In fact, it can be fun to mix it up a bit! Should I invite my junior bridesmaid to the bachelorette party? The short answer is no. 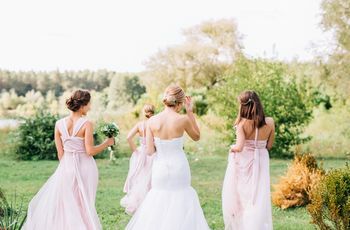 If your bachelorette involves activities geared toward the ages 21-and-up crowd (bar hopping, touring a vineyard, jetting off to Vegas...) then it’s safe to say your junior bridesmaid should not be included. However, if you’re planning something more low-key and—ahem—wholesome, like a spa day or a movie and game night in, feel free to bring her along if you’d like. Is a junior bridesmaid supposed to get ready with the rest of the bridal party on the day of? Again, this is entirely up to you and your junior bridesmaid. You don’t want to exclude her, but you also don’t want to put her in a situation where she might feel awkward and out of place. Take her age and personality into consideration: a shy preteen may not feel completely comfortable hanging around a group of women, whereas an outgoing 14-year-old might jump at the chance to get in on the fun! Also, consider the crowd: will it just be you and the bridesmaids getting ready, or will the mother-of-the-bride, mother-of-the-groom, flower girls, and other friends or relatives also be around? When in doubt, we suggest inviting your junior bridesmaid to join a bit later in the day—after the other bridesmaids have arrived but before the flower girls arrive (if there are any). This way, she’s included and can have some fun girl time without feeling overwhelmed. Where does the junior bridesmaid fit into the ceremony order? Traditionally, the junior bridesmaid processes down the aisle right before the bridesmaids. 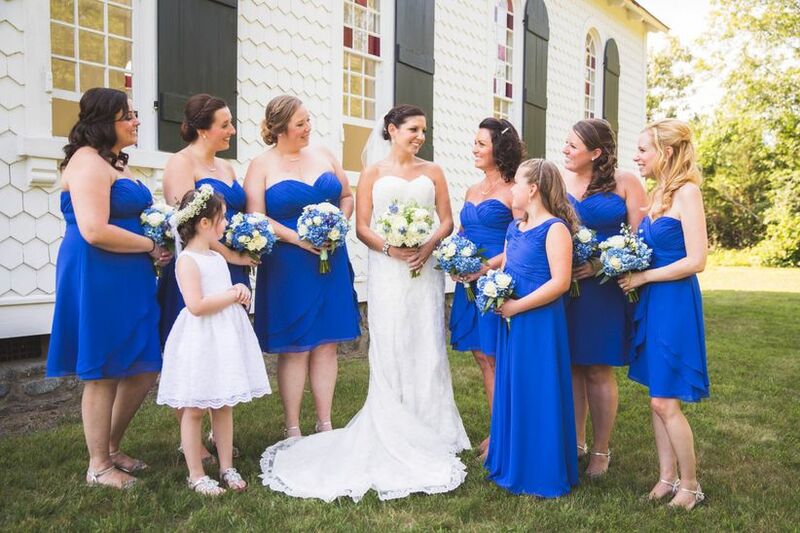 If you are choosing to have the groomsmen and bridesmaids walk down in pairs, the junior bridesmaid may be escorted by a groomsman just like the other girls. Where does the junior bridesmaid stand? During the ceremony, she stands at the far left at the altar (on the outer end of the bridesmaids, the farthest away from the bride). During the recessional, she exits last—either alone or paired with a groomsman. Should a junior bridesmaid be included in all of the wedding party portraits? If you are planning on having traditional wedding party portraits taken, there will likely be three arrangements: 1) couple + bridesmaids + groomsmen + other attendants (e.g. flower girls and ring bearers), 2) couple + bridesmaids + groomsmen, and 3) bride + bridesmaids. The junior bridesmaid should certainly be included in arrangement one. After that, we recommend including her in at least some, if not all, versions of arrangements two and three. If you would like a couple portraits with just the bride and bridesmaids (no junior bridesmaid), that’s perfectly fine. Just make sure you clearly communicate your wishes to your wedding photographer ahead of time so he or she can take charge.